Let me confess, I've made my fair share of smoothie flops. I once thought I could just wing it and throw what ever seemed like it would make a good smoothie into the blender and let it rip. Quite often my ratios of liquid to fruit were off and for every smoothie hit, there were a couple of flops I'd still have to choke down. Smoothie bowls have become a favorite afternoon snack to fuel up my girls before their dance and gymnastics classes. I tend to use juice or vanilla yogurt to sweeten smoothies and never rely on additional sweeteners such as honey or agave, I just prefer the sugars in the ingredients to create the right balance. Now I rely on Whole Foods as a resource to help me make a well balanced smoothie, every time. 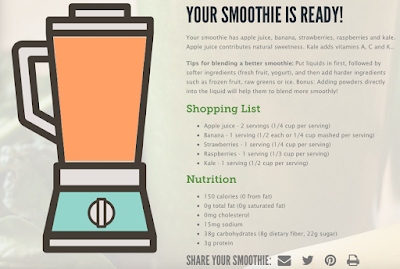 With their smoothie nutrition calculator you can even get a sense of how your favorite homemade smoothie is doing in the nutrition department. Scroll to the bottom of the calculator page for smoothie recipe inspiration! Knowing this blog is still here fills me with a warmth, even if I don't honor the platform in the way I once did. The majority of my favorite blogs have shuttered in the past couple of years. I miss the way bloggers put words together, the way they offered glimpses into everyday life, and how we felt so connected. Social media has not replaced the longing I have for opening up Reader and spending my late night alone time reading blog posts. Feedly is just okay and I subscribe to about 12 blogs that still update weekly. Weep, 12. I'm plotting my path on how I'd like to offer glimpses into some real change I've experienced in the past few months. It feels important to process through this medium, to set my words free, to connect with others with an openness and vulnerability. As for now, my journal pages have been receiving much love and attention. Stay tuned, for the stories shall unfold.